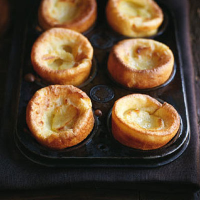 This recipe is adapted from one of Jane Grigson’s; the addition of horseradish adds an aromatic sweetness to the puddings. Preheat the oven to 220°C/gas 7. Put the milk, salt and horseradish in a bowl; rest for 15 minutes. Pour the oil into muffin tins or into a 30cm x 20cm roasting tin; heat until smoking hot. Crack the eggs into the milk mixture and whisk with an electric whisk until airy. Add the flour and whisk again until air bubbles have formed at the top of the batter. Pour the batter into the hot tins; cook for 20 minutes (20–25 minutes if using one roasting tin), until risen and golden. The Corker recommends - if your puds are accompanying roast beef to the table, try red Châteauneuf-du-Pape. This recipe was first published in January 2008.